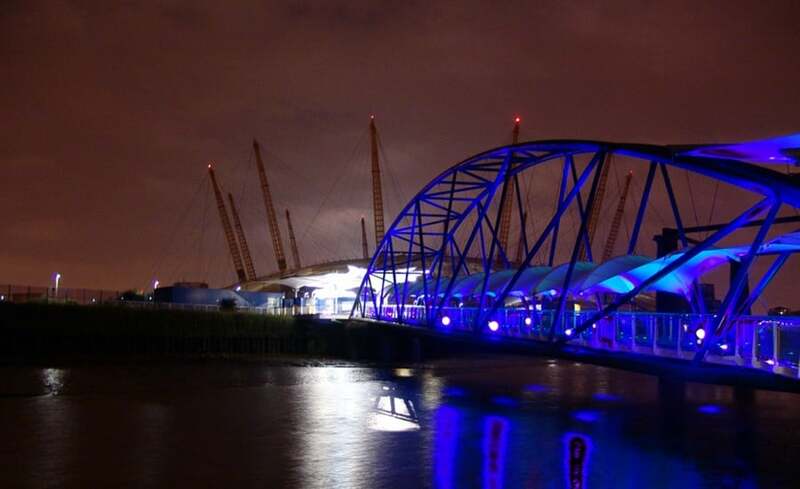 Early in 2007 Architen Landrell was thrilled to be awarded a number of projects at the redevelopment of the O2 Dome including the design, manufacture and installation of a covered walkway linking the Dome to the Queen Elizabeth II Pier in the Thames, creating a weatherproof VIP entrance. Stretching approximately 150m, and leading from the bank side to the entrance of the entertainment centre, the walkway was designed to provide complete weather protection for the VIP guests. 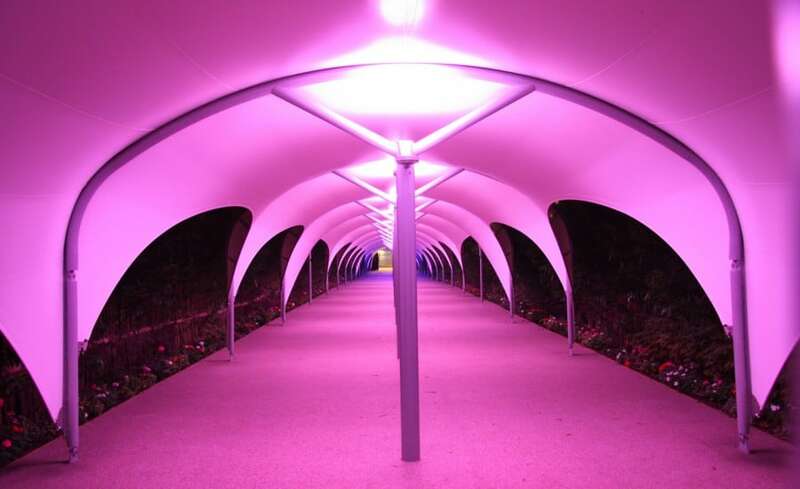 A wow factor was also important to the client and though the walkway provided an impressive entrance, the addition of interactive lighting ensures a stunning arrival. 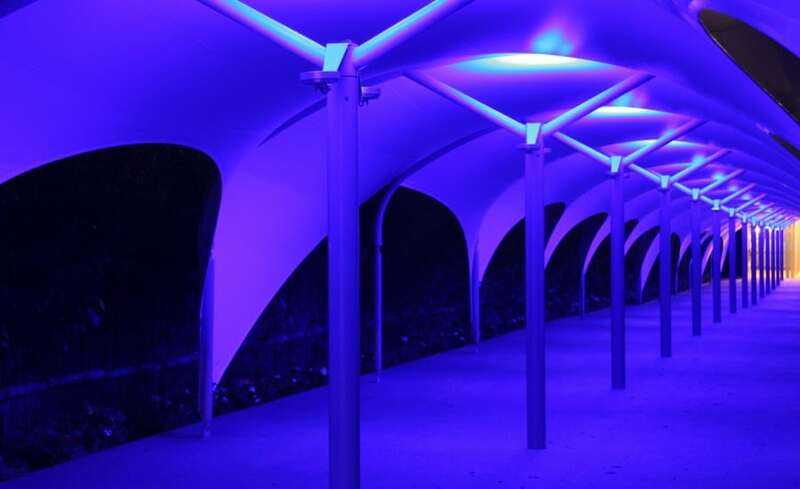 Architens lighting division was tasked with the design and supply of an interactive lighting system that lights the walkway in an array of vibrant colours as the VIP visitors progress to their destination. 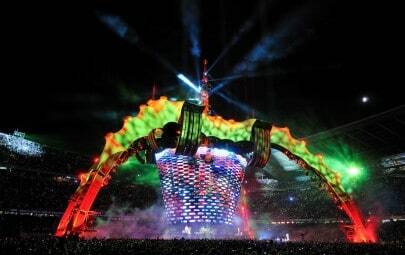 A whole host of impressive programmes and effects were created using the latest Tryka colour changing LED and Pharos LPC control systems. Also included in Architens project was the refurbishment of the existing lighting which included the replacement of over a thousand light bulbs and extensive servicing control equipment. Two additional inverted umbrella canopies located on the pontoon were also thrown into the Architen brief, as was the installation of a further three inverted cone canopies on the bankside on the canting bridge. After a rigorous vetting procedure, Architen Landrell provided the most cost effective solution and with our past record, the client was assured of quality work and delivery on schedule. Benefits for the client also stemmed from the fact that Architen could deliver the whole package. At the clients request we recycled existing steelwork that was redundant, we managed the complete design of fabric, steelwork and lighting in house, and we were able to deliver the whole package from steelwork and fabric to lighting and control systems, even maintenance of the existing structure! The large spans at each end of the walkway were challenging but necessary in order to enable emergency access for vehicles. 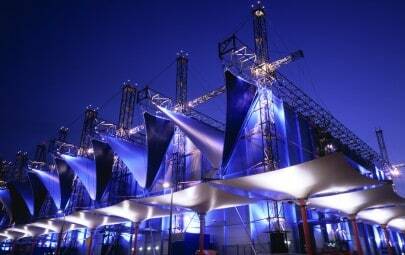 Integration with existing structures also made it an unusual project for our desing team. As the pontoon moves up and down with the movement of the tide, the canopy had to be designed to move with it. 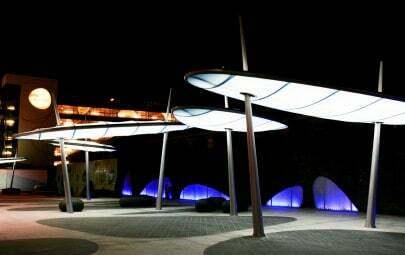 Though the canopy was fixed, the tolerance had to be compensated for to ensure 24/7 coverage. Working over water proved a challenge for the installation crew. Although not new to this type of installation, they had to adhere to strict Port of London regulations which prohibited dropping anything in the Thames or upsetting the balance in any way. Use of a barge crane during a very low tide was also a challenge, one which was overcome by long working hours to suit the tide, along with the hard work and perseverance of the team. The result of the hard work and skill of the Architen team is undoubtedly impressive, and those who enter the O2 from this walkway cannot fail to feel like a star.